I managed to stamp something today! It's a miracle! It has been quite a week to say the least. 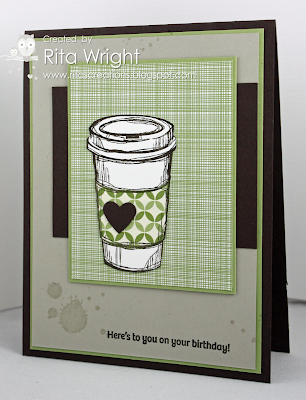 I needed a bit of a break, so I skipped lunch today and stamped instead. When you know you only have an hour, you do what you gotta do to get inky. ;) I played along with the colors at Create with Connie and Mary and the sketch at Sketch Frenzy Friday. I don't know what's going on with Laila, but after throwing up on Tuesday morning, she was fine. We left out to go to Target yesterday morning and it started again. That was "fun". It was my first experience having to take the car seat apart and figure out if I could clean it up enough to save it. It needed a bath and so did both of us. I sure missed Jason being here to help, but we made it through it all and I managed to wash everything and everyone. Laundry is never ending this week! Anyway, look how tall she is! Crazy how fast they grow. Fun, huh? I had to make my card pretty quickly because Laila was sick, so mine is simple again this week. 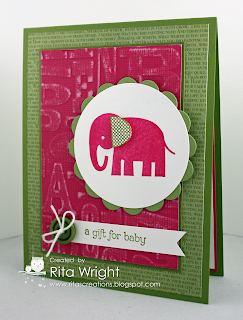 It uses some retired designer paper and a cute set/die from PTI. 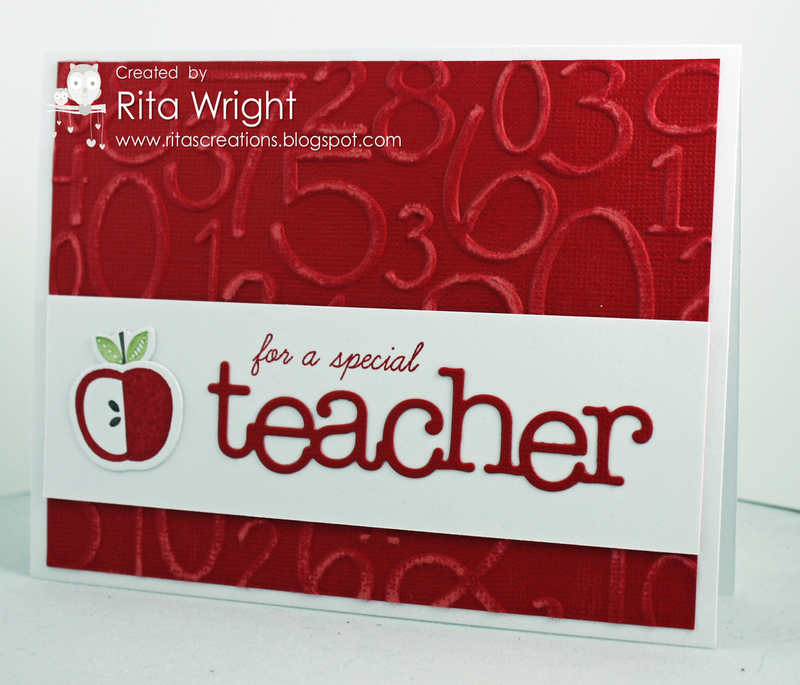 School started back down here in Texas this week so I figured a teacher card was perfect! Monday was a great day for us as a family. Laila was so sweet and so well-behaved. It was just wonderful. 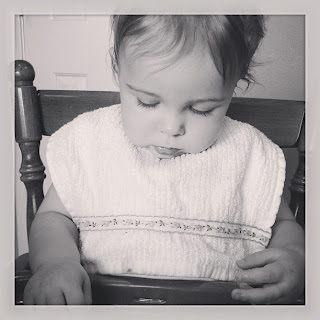 That night she got sick and threw up, then did again at breakfast yesterday morning. She was in a great mood and playing, but she just didn't seem to handle milk/food well. 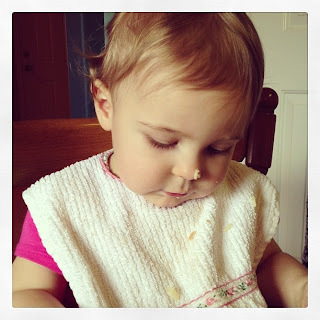 We switched to clear liquids, bananas, toast, and applesauce for a while and she was okay. I hope she's fine now as I really hate it when she's sick. Whew. I didn't think I'd get a card made for today but I managed to get one together. 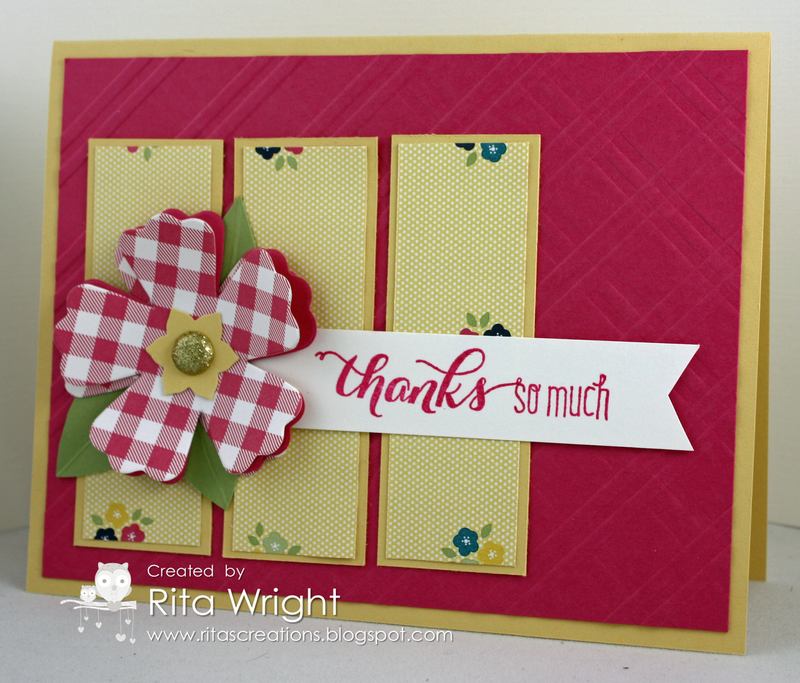 I put the scrap panel together at the end of my open stamping event today and finally made it into an actual card tonight. I was hoping to go to bed early and NOT stamp, but Laila took a long nap and is up and CRAZY. I figured I might as well keep my scrap card series going. 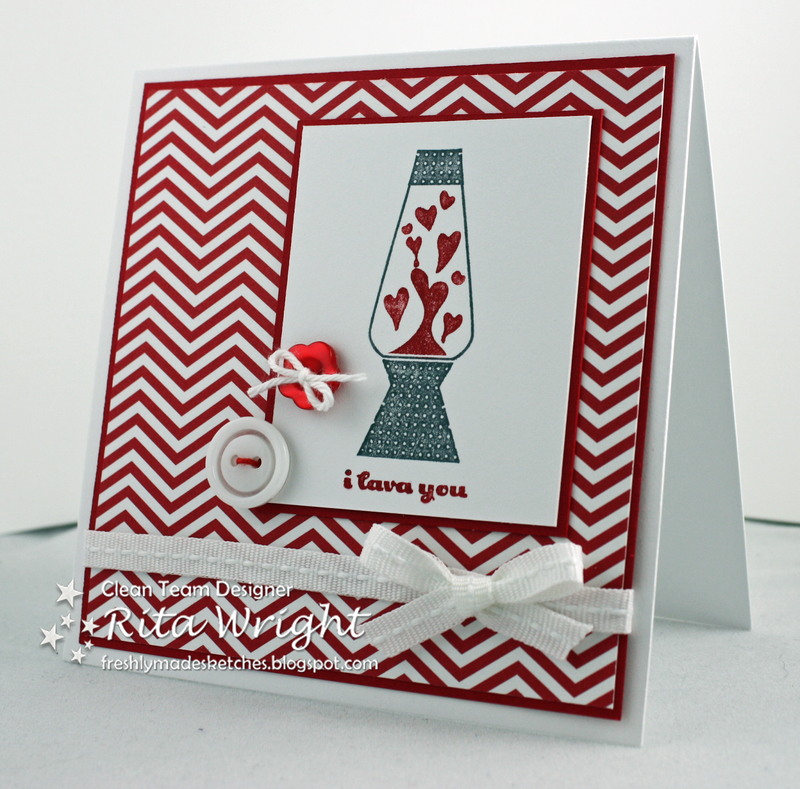 If you are up anyway, why not stamp? I decided to try stamping again during nap time today and almost got a card made before she woke up. It was another trying morning and it definitely helped to give my brain a break to create! 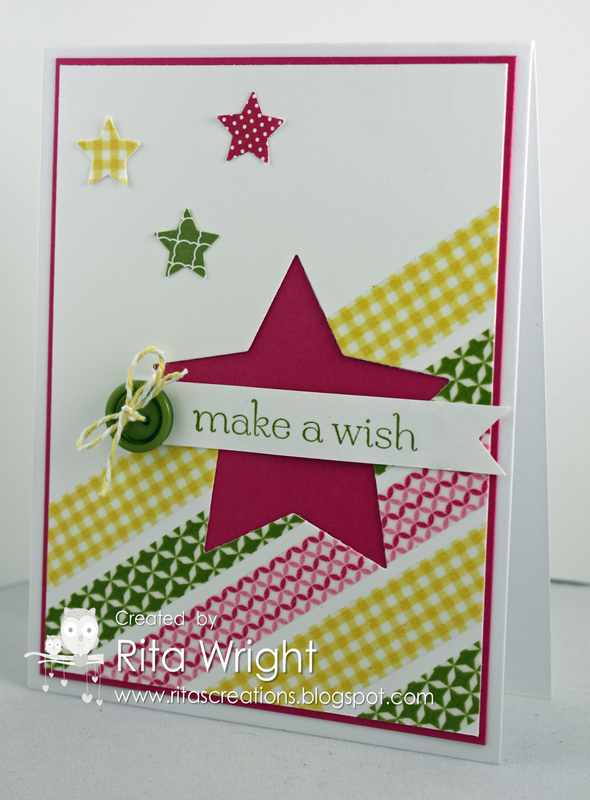 I played along with the sketch challenge over at Create with Connie and Mary for this one. She was so tired at lunch. She finally went to sleep not long after this, but she would not earlier when I tried. We are down to just an hour nap each day if we are lucky and it's not really enough. She's been working on walking more so I am hoping it's just that and things will sort themselves out soon. I was able to order a couple of new goodies last week and they finally came yesterday. Laila went to bed somewhat early, so I headed off to my room to get some stamping in. I've been on the verge of just quitting this week, but I know I *need* to stamp so I decided to give it a go. This has just been one of those awful weeks and no matter how much I try to make it better, it just seems to get worse. Laila fought her nap for almost 2 hours yesterday and then after an hour of sleep, woke up just as grumpy as she was before it. I was at my wit's end to say the least. We survived though and today is a new day. The big Thank You stamp is from the new photopolymer set called Another Thank You. It's my first of those sets and I did enjoy using it. 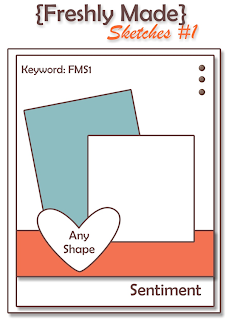 I also made my own envelope using our new envelope tool that will be available for everyone starting next month. 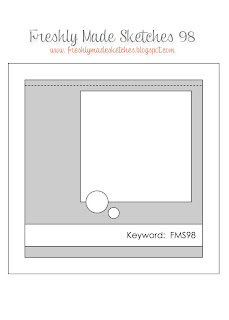 It was super easy and I am excited about being able to use up some of my DSP to make them! 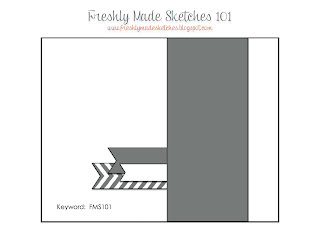 It's sketch 100 at Freshly Made Sketches! How exciting, right?! To celebrate some of our past designers have come back to play along and there are some prizes up for grabs. 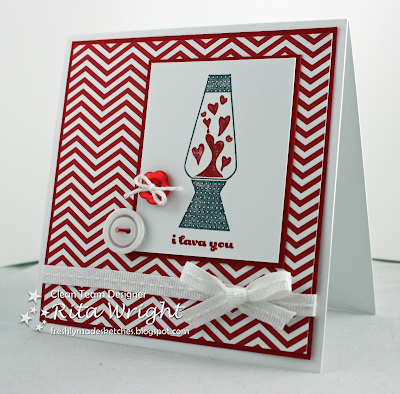 Be sure to go over and check it out and then get busy on your card! :) I am LONGING for Fall. Even though we don't get a real one down here in Texas, we do get cooler temperatures. I'm so ready for those as the 90-100 degree days are draining and blah for me. Back to my card... 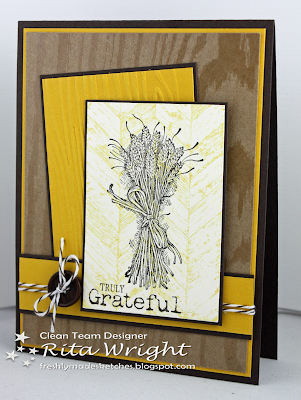 I decided to use my new fall set, Truly Grateful for my card this week to help usher in that cooler weather. We'll see if it works. ;) I'm still deciding on Crushed Curry as a replacement for More Mustard. I forgot to mention that we are going retro and doing our very first sketch all over again this week! Do you remember it?! Laila has been a little better the past few days and we managed to get out of the house on Monday. I'm hoping we can do a quick trip to Kohl's today but that's her least favorite store because of the weird shopping carts. We just need a small crock pot, so that shouldn't take too long, right?! She took a few steps several times yesterday, so we are excited to see her finally doing that. She's not ready to take off just yet, but she's starting to test out the waters a bit more. Jason made risotto for dinner yesterday and she sure loved it! Another of my display samples for Convention. I wanted to do something in some of the bold, bright colors as this stamp seems perfect for a little boy. To me anyway. :) I made a red button using the Simply Pressed clay and molds. Another picture from our beach excursion. She was VERY upset when she left the water because she loved this rock and shell that she had found. She tried to eat them a few times, so we figured they were best left in the water. She was not in agreement. Sunday scrap card! Woo hoo! I managed to keep up my streak. :) For this week, I used some longer scraps ( at least 6 inches) and the bargello technique. Have you tried it? You should give it a go as it's kinda fun. Splitcoast has a tutorial here that makes it pretty easy to figure out. My niece had her birthday party at the beach yesterday, so we made the almost two hour journey down there to celebrate with her. It was Laila's first trip to the ocean and she had fun in the water. Riding in the car for that long was a whole other matter, but we made it there and back. 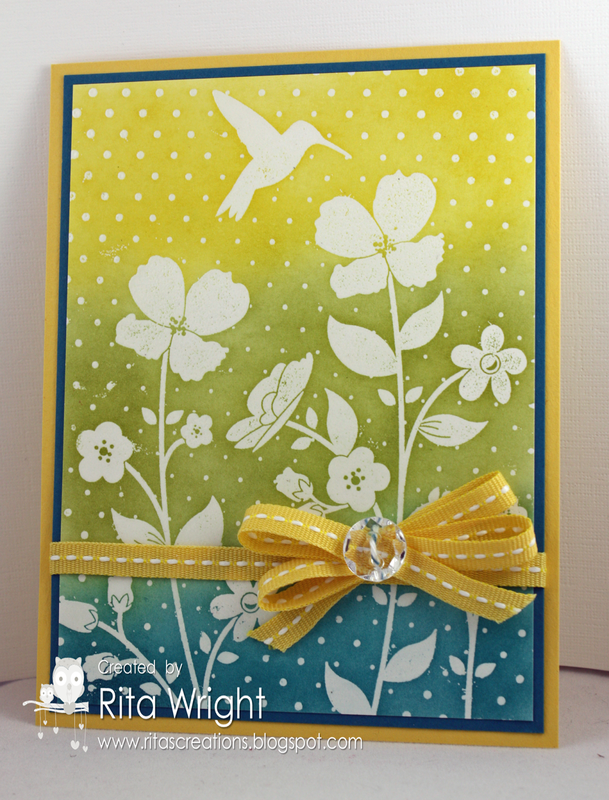 This week I worked on some cards for my next event, an open stamping day. I design the cards, send a picture and supply list to customers, and then they bring their consumables and make them using my stamps/inks/tools. 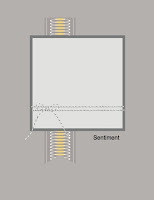 I always provide sketches with the measurements for them so that they can use them again for other ideas at home. I love that they have the experience of cutting and making everything all by themselves. 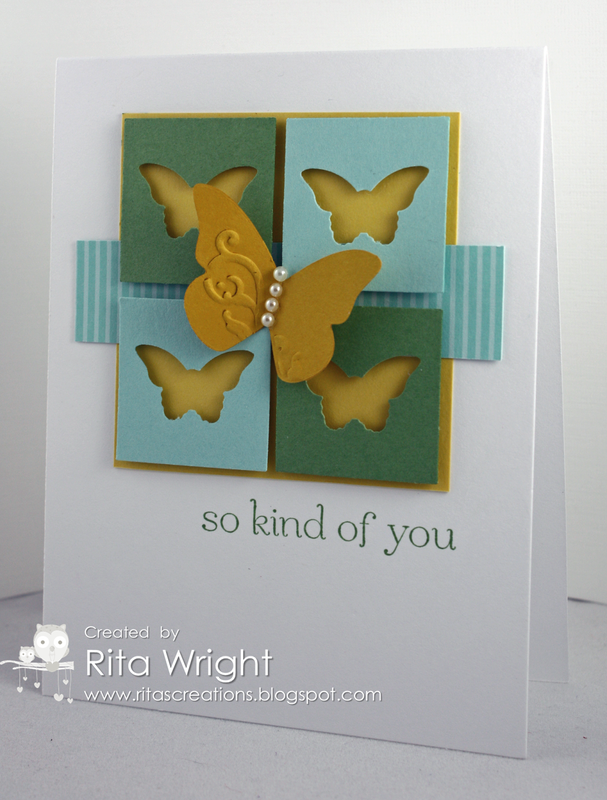 :) I used the awesome sketch at Retrosketches this week for this card we'll be making. My little kitchen helper. :) She loves her whisk. Today has been a better day. We went to the program at the library and then to the craft stores to look around. It was nice to get out of the house for a bit. It was over 100 degrees again today, but we had a nice storm come through this evening and it's cooler now. Thank goodness for that! 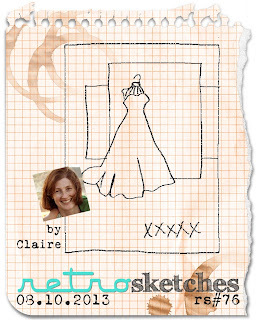 Time for a new sketch at Freshly Made Sketches! 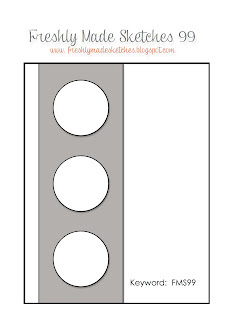 I'm the hostess this week and I created a simple sketch with a trio of circles. 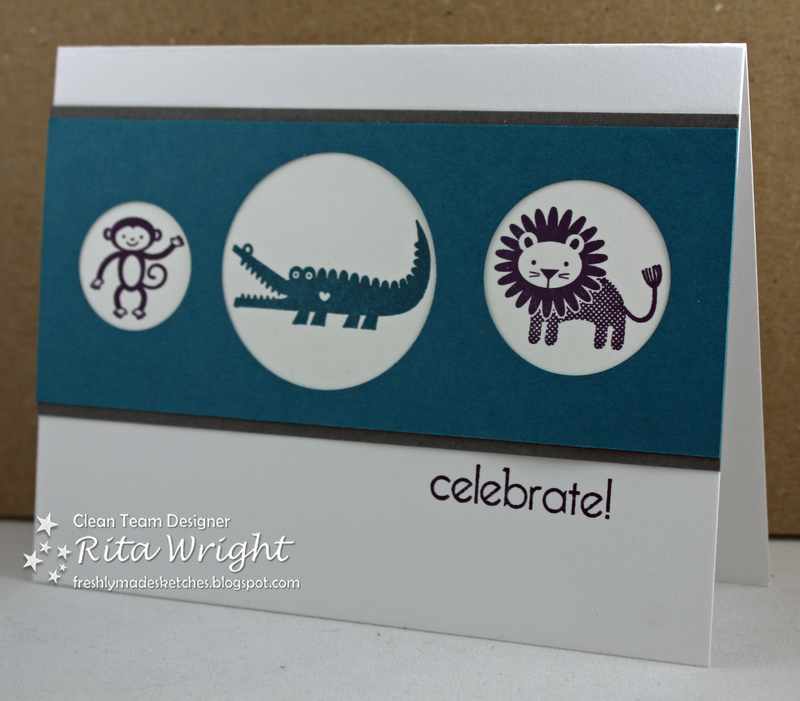 For my card I did a very clean-and-simple card with the adorable Zoo Babies set. I picked a color combination from the Color Coach that looked interesting, grabbed my circle punches, and got down to business. 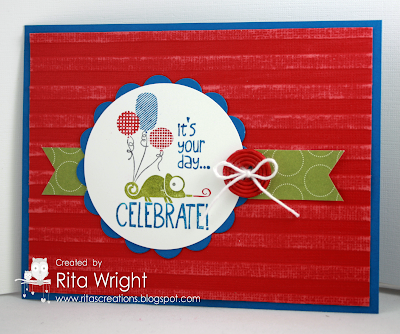 It's not a great card, which is kinda bad on my hostess week, but my heart just isn't into stamping right now. It's been a rough week already for me and I want to hide in bed rather than stamp. Hopefully that will go away and I'll get back to enjoying it. Just feeling a bit off I guess. Family issues and a little one who refuses naps and bedtime will do that. Here's another of my Convention display samples. This one uses Gorgeous Grunge to make a splatterific birthday card. LOL You never know what you'll find in the playroom bins! 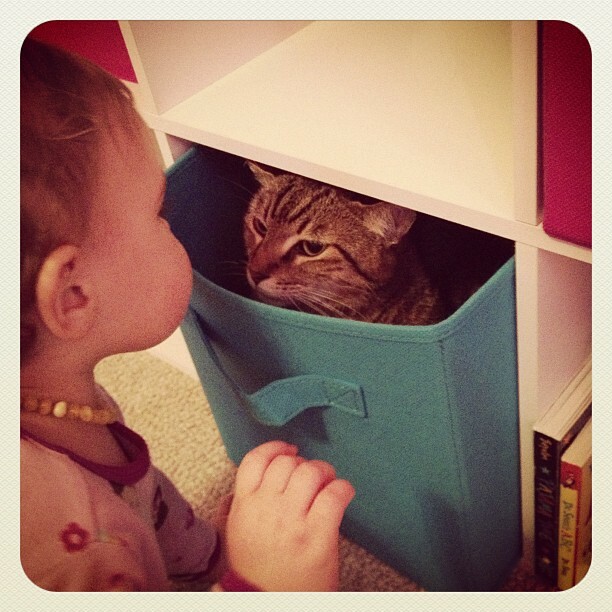 I guess they are a good place to nap if you are a feline. I spent a lot of the day stamping, but most of it was for my open stamping event that's happening in a couple of weeks. I thought it was NEXT Sunday and I was totally freaking out! 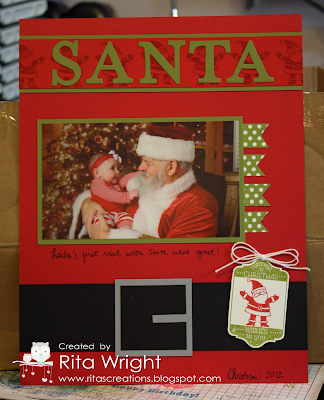 Once I figured out that it was actually TWO weeks away, I took a break to do my scrap card. :) This one uses an old Deconstructed Sketch. It's pretty simple, but kinda different for me. Laila loves to help out in the kitchen and pull all her "dishes" out of her cabinet over and over all day long. She does not love when she can't reach the bottle of bay leaves that fell between the counter and the refrigerator. In fact, a meltdown of sorts was needed. Sharing another of my display samples today. 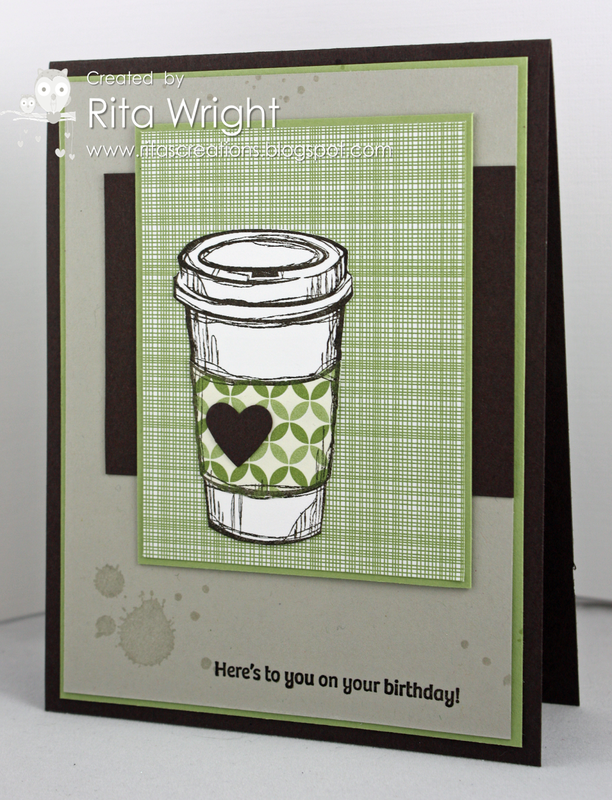 This one uses emboss resist again, but this time with the Gorgeous Grunge set. Simple, but I like it. :) I wish I'd left the piercing off, but I think this one was made in the middle of our water issue. We went a few days with no water, I had to move my stamping to the hot dining room because my wall had a leak, and it was just miserable all around. I think I needed to take out some anger, so piercing it was... Better paper than people, right?! 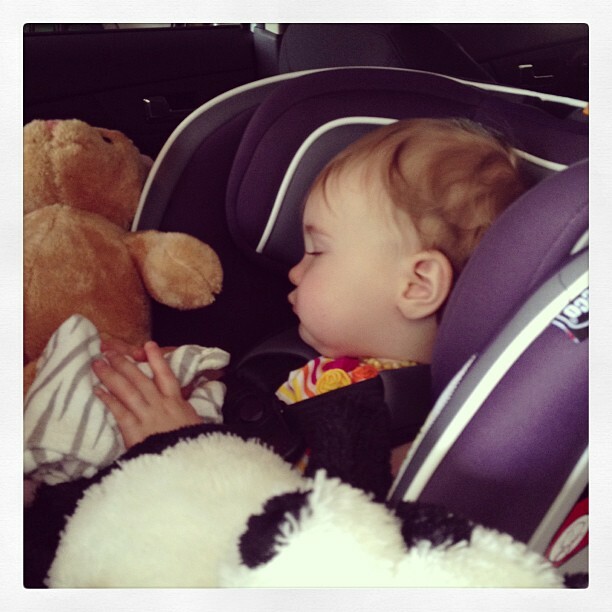 Laila and I went to our second home (you probably call it Target) yesterday and she was tired after our shopping. Even though it is less than five minutes from there to home, she crashed. I was able to move her to her bed and she stayed asleep. Now THAT'S tired! She took two great naps yesterday and ate a ton...growth spurt maybe? 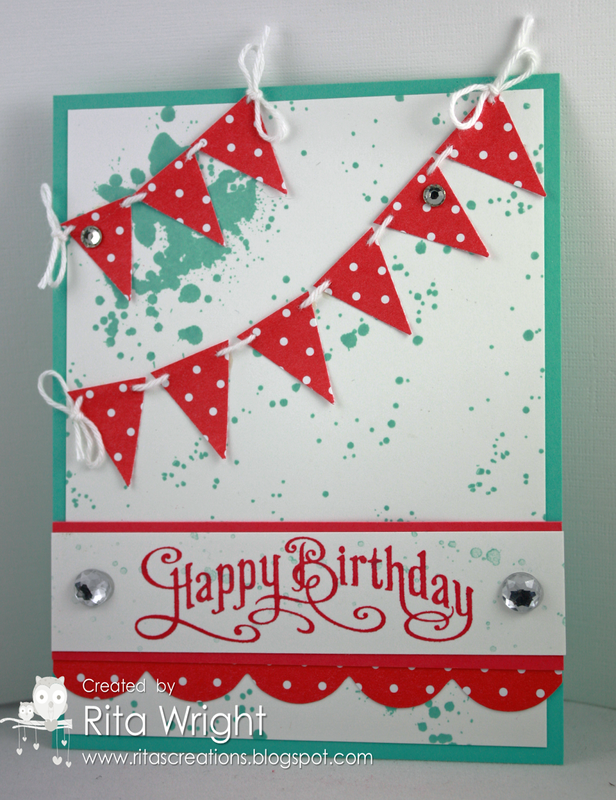 The amazing Lesley has created another fun challenge blog! This one is called Seize the Sketch and this week is their first sketch. I had to go play along of course. :) I used some of my new contraband but also some of my fun SU stuff too! This top picture of Eli is one of my absolute favorites. It was taken on Thanksgiving of 2008. We had no idea he was seriously ill until a few days after Christmas. In a matter of 2 weeks he went from a healthy looking baby to this poor thing in the bottom picture. SMA is such a cruel disease and I recommend anyone thinking about having kids to be tested for their carrier status. Laila is a carrier and I am so thankful that we know that already. I hope she will never endure losing a child like we did. Knowledge is power. Time for a new Freshly Made Sketch. 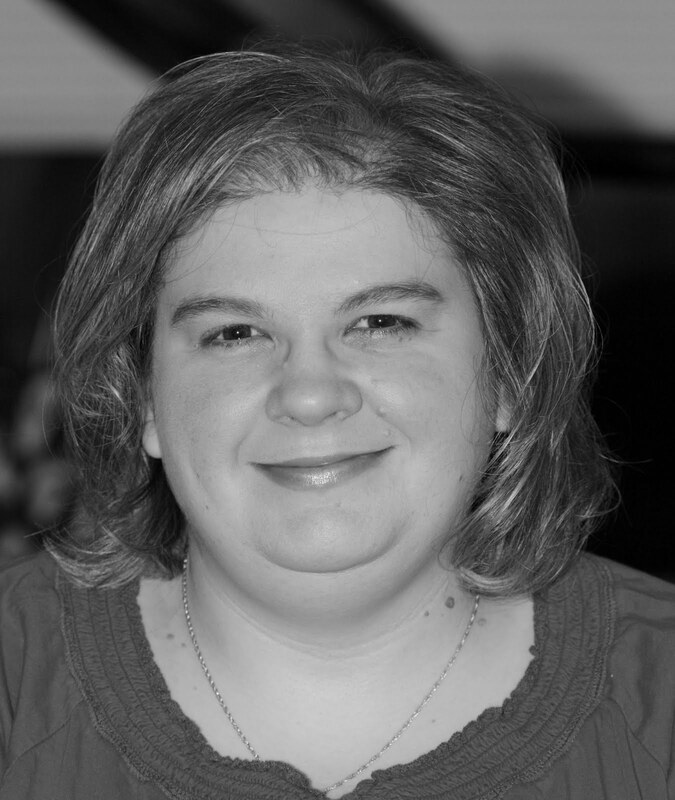 Our hostess this week is Jen Mitchell. I'm a big fan of Jen's and she's inspired me so much. I now try the occasional clean-and-simple card with lots of white space because of her. :) I didn't manage it this time, but I did keep it pretty simple. 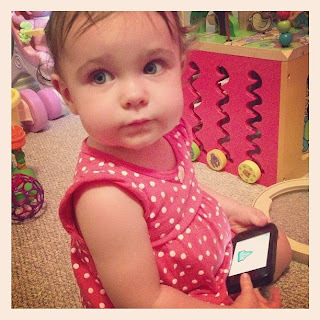 Laila really enjoys the Fisher Price games or Dr. Seuss books on our iPhones. She does not enjoy when they end and she has to give them back. Here's another of my Wildflower Meadow samples that I made for the Convention display boards. 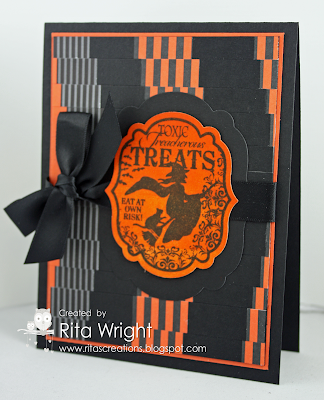 I thought it might be neat to use emboss resist with it and it turned out okay. Not sure about those faces! lol We had a nice day out yesterday going to Archiver's, lunch, and then Costco. Sunday night was rough, but she crashed yesterday morning for a bit and we were all able to go back to sleep. Once we were up we needed out of the house! Teething is rough on everyone for sure. 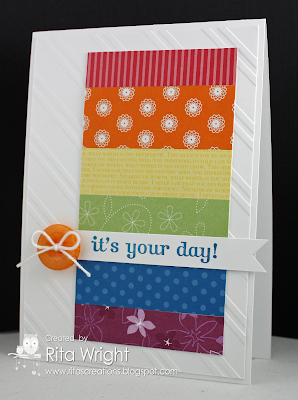 I combined my scrap card with a Dare To Get Dirty challenge this week. Everything on it minus the base and first layer came out of my scrap bags. The base, layer, and ribbon were all left from yesterday's stamping, so I was happy to use those up too! 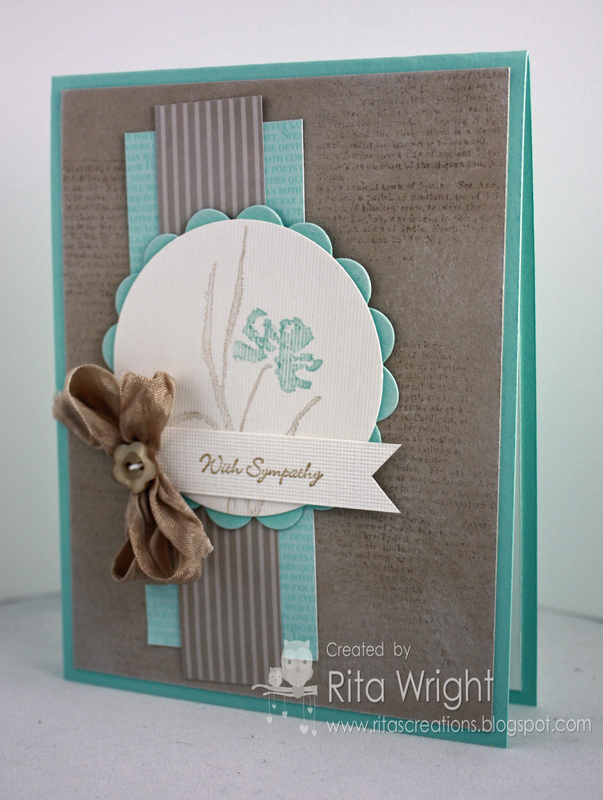 I don't really know how to do sympathy cards that well because I like fun cards, so hopefully this one is okay. Do you like the Crumb Cake layer? I inked up the Dictionary background here and there with Versamark and then stamped it. 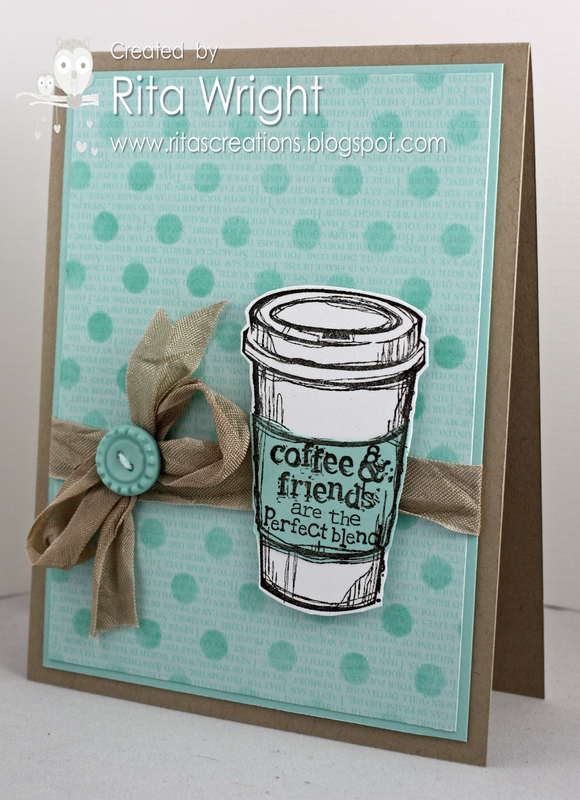 I like the hint of words without stamping the entire layer. It adds interest but doesn't overwhelm the card. I also sponged pretty much all the layers with Whisper White craft ink to soften it a bit. I managed to stamp a bit over the past few days, but not as much as I would have liked. 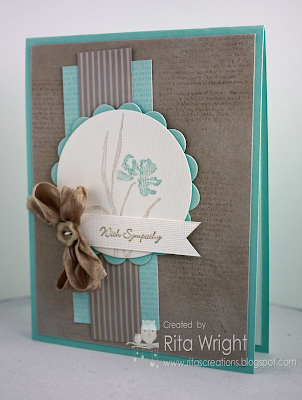 This is a card I made on Thursday and finished up yesterday. All that I'm sharing are for the Dare to Get Dirty challenges. The deadline for them is Monday, so I am not going to get many more finished. 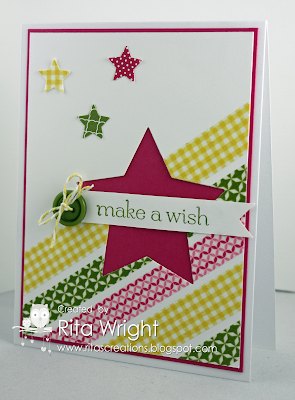 I will try to use one with my Sunday scrap challenge tomorrow for sure though! This one is kinda fun and uses some contraband that I recently fell in love with. I make cards for a local shop and needed some easy teacher ideas I could whip up in a hurry! This fits the bill! A simple one, but I think it's kinda cute. I used Pool Party with Crumb Cake and I really like that combination! I don't really like this one, but I thought I'd share it anyway. It uses ribbon scraps and some old DSP. I struggled a lot today with my stamping. My mind is just a bit cluttered with all that's going on this week. I guess I stamped more for the therapy aspect than the "I'm going to wow people with this cards" one. After bath picture. 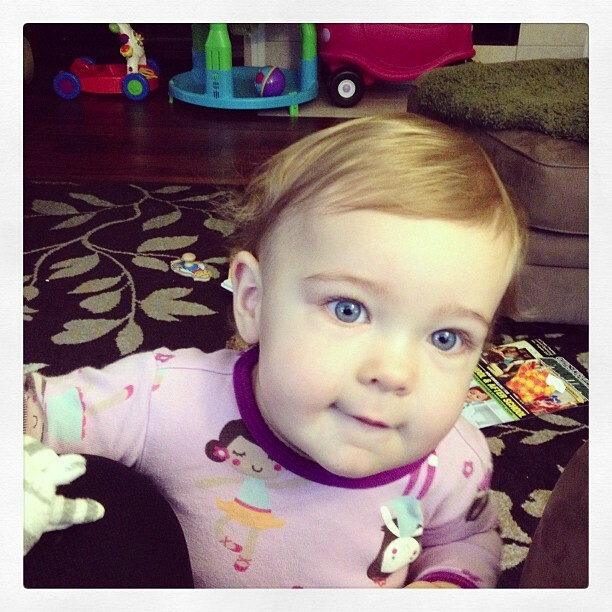 :) She's getting so big! Today was a bit better than yesterday as she slept all night and then napped okay. Jason looked and thinks she might have TWO molars coming in. I'd be totally grumpy too!!!! We gave her some Advil last night before bed and again tonight, so I hope that helps her sleep. I think it might work better than the Tylenol that we tried earlier today. I'm feeling even more clueless than normal lately with all her new independence and tantrums. Kids really should come with a manual! April 2019 Release Wrap Up!